An open letter to all Hotel Managers, Execs, CEOs and anyone responsible for the hotel accessibility policies. It is 2016 and the world is full of wonderful technology which is enabling people to do things that hadn’t even been thought of, less dreamed about 40 years ago. Some 47 years ago we put a man on the moon using what is now considered ancient technology, but we still did it. In 2016 disabled people who want to stay in a hotel just like any other human being simply can’t just because they need some technology to support them, namely, a simple electro-mechanical ceiling hoist to get them from their wheelchair to the bed and back again. Is that too much to ask in 2016? Why in 2016 are there less than 17 hotels in the whole of the UK and Ireland who can offer their disabled guests a ceiling hoist? 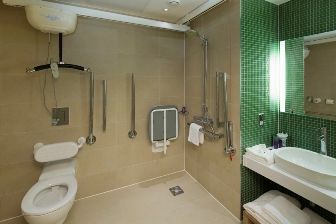 Of those 17 hotels, 4 are specialist ones offering holiday and respite care especially for customers with disabilities. Outside of UK&I we are aware of just 9 more mainstream hotels who can provide their customers with a ceiling hoist and 7 of them are in Las Vegas! I believe that all the people that this letter is aimed at should spend just 1 of their working days accompanying a wheelchair bound hoist user going about their daily life. I am sure it would change their attitude towards disability – I know it did mine. I was once a person in the street who hadn’t really given disabled people any real thought. I may have held a door open or moved out of the way but that was about the extent of my involvement. I then met the late Sue Maynard Campbell MBE, Managing Director of the Disability Consultancy, Equal Ability, and the founder of the CHuC website. After a few hours I began to appreciate the hurdles she had to overcome just to go about her daily life. I had never bothered about a 3” step up into a shop or public space. I could just lift my feet and step up but to Sue in her wheelchair it was a barrier that she couldn’t pass. I began to see these barriers all around. The environment has improved but still has a long way to go. Some of it is physical adaption but education of able bodied people who don’t need to consider these barriers is just as, if not more, important. Why would you do something to overcome these obstacles if you don’t see them as such? It is the same for hoist users. They are just normal people who want to do normal things like visit friends for a weekend or go to a reunion or just get away for a break but they can’t find anywhere within 100 miles of their chosen destination that can provide them with a ceiling hoist. Is this really 2016? Modern ceiling hoists don’t need to be bulky and ugly spoiling the aesthetics of a hotel room. Track can be recessed into the ceiling and can even have built-in lighting to act as a ‘feature’ when a hoist is not in use. A hoist can be shut away in a nice looking bedside cupboard when not in use, charging the battery, so it is ready for use when required. A hoist installation isn’t that expensive at around £4-5K, not much in the big scheme of things but it makes many people’s lives just that little bit better! A ceiling hoist in your hotel can bring in a lot more income, especially if you have meeting and conference facilities. People will book your facilities for receptions, conferences or parties because you have the hoist. It would be a positive asset! 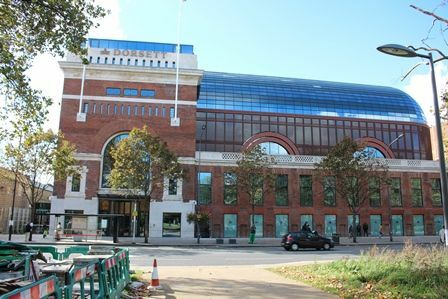 One major hotel chain say they identified an additional £300K of income in the first year after installing a ceiling hoist through conferences, receptions and meetings which were booked because they had the room with a ceiling hoist. Lastly a plea to those who already have hoist, and those hotels who may install one, to publicise it! So many websites fail to mention anything about their hoist or else it is tucked away in the small print of their accessibility page (if they have one!). Embrace it - get the message out and people will come – use it as a USP! Let’s make 2016 the year the world changed for ceiling hoist users! The IHN Hoist Guidance Document has now been published and can be downloaded from our website. The document is a comprehensive best practice guide aimed at accommodation providers but also useful for anyone considering installing a hoist. It explains what a hoist is, the different types available , the business case along with some case studies of existing accommodation providers with hoists. It's a must read document for ALL accommodation providers. CHuC had a significant input to this document and we hope it will persuade more accommodation providers to install a hoist...or two...or three! There is also a similar guidance for Access to Hotels for People with Hearing Loss that can also be downloaded from here. New accommodation with a ceiling hoist just isn't happening. A few of our website users and Twitter followers are actively campaigning for more hotels to install hoists but with little success. This just isn't good enough. We want to create a campaign similar to the Changing Places one. They are just about to celebrate their 1000th Changing Places Loo which is a fantastic achievement. They have achieved this by contacting MPs, Councils, retailers, sports facilities and similar venues with great success. There is a new campaign website which CHuC fully supports where you can download template letters and lots of other information to send to your local MP, and hotels and other accommodation in order to persuade them that there is a need for ceiling hoists to be installed. We want you to bombard your MPs and the hotels where you want to stay with these letters to show there is a demand for these facilities. 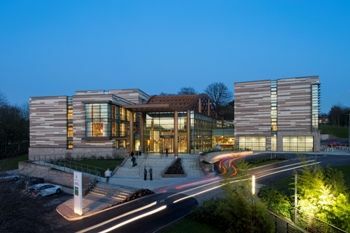 Please have a look at the website www.accessiblehotels.org.uk and get involved! FLAT SPACES is a new concept in accessible holiday accommodation. Born out of the idea that with new building technologies a well designed flat level holiday cottage could easily be replicated around the country, if not further away! Our plans are nearly complete, but we need input from as many people with disabilities as possible, to get it right. Each dwelling will have complete flat level access, two large main bedrooms, open plan living areas, wide doors, a ceiling hoist have been taken into account with wheelchair users and the less mobile in mind. UPDATE - the first Flat Spaces property is now complete in Ropley, Hampshire. The alternative to a ceiling hoist? The HandiMove Wall Lift can be fitted to a bracket on the wall or on a floor to ceiling post and can be moved from room to room with additional brackets or posts. With a lifting capacity of 145kg and a maximum reach of 1.3m this is the alternative to a fixed ceiling track hoist so now you can install a fixed hoist even when the property has a low ceiling. 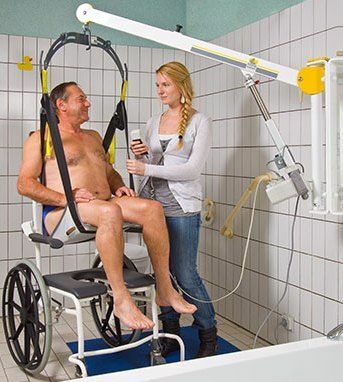 It is available in UK from Dolphin Mobility, Lindale Healthcare and Lynch Healthcare. It is also avalable throught Europe, Israel, South Africa, Australia and USA. At Last - a hoist in Dublin! 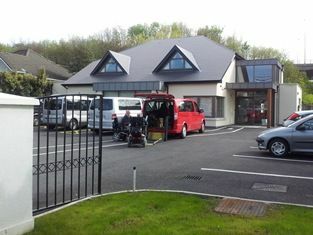 Muscular Dystrophy Ireland (MDI) now has accessible accommodation available at their HQ in Dublin. It consists of 4 bedrooms, 3 of which are fitted with Liko hoists on an X-Y frame to cover the whole room. 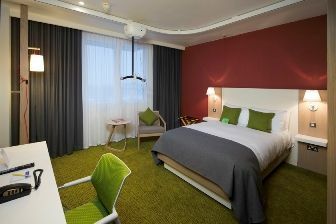 You can book a room for 1-7 nights at just €25 per room per night. The appartment is fully equiped and the bedrooms have hi-lo profiling beds. More details are available here. We need your help! Do you know of any other accommodation where ceiling track hoists are available for the guests? If so please let us know and we will list the details on our accommodation page. CHuC does make a difference! I have just returned from a weekend in London which for the first time actually was an enjoyable and stress-free experience. This was due entirely to the work of Sue and the organisation who managed to get a overhead hoists installed at the Holiday Inn Kensington to name but one location. I cannot explain the joy I have had from being invited to a party in London for my Best friend's 30th birthday and actually saying yes I can attend. So often I have to decline offers as I'm always held back by my inability to transfer independently without a hoist. The hassle of trying to organise equipment and use it in inaccessible rooms has been well documented on the CHuC website. This weekend was different there was no hassle whatsoever and I am still buzzing now to be honest.